I teach fully online classes, and blogs are "the classroom" where we meet online; it is how my students and I all interact with one another, and I've been using blogs this way for over 10 years now. There are lots of different blogging tools out there, but I've tried to make the tips below software-neutral, focusing on what you can DO with blogs... and then you can decide on the specifics of how to proceed with your own classes. So, hoping for a world in which everybody blogs (! ), I've listed 10 Blogging Tips below... plus four pre-semester strategies to gear up and get ready to go. Become a blogger yourself. Before you start blogging together with students, take a semester (or summer) beforehand to do your own blogging and see what it's like. Create your own blog, post regularly, and read other people's blogs too. Are there other people at your school who blog? Get in touch with them and see what advice they can offer. Ask questions, and learn how to make the most of your blog. Your experience and enthusiasm will be a big boost for your students as they get started! You might blog on topics related to your course, or you might keep a blog based on some other personal interest or project. For example, I don't teach Latin anymore, but I do keep a Latin blog: Bestiaria Latina. Learn how to use a blog aggregator. A blog aggregator, also known as a feed reader, allows you to follow lots (LOTS) of blogs so that all the posts are consolidated in one place. You can organize the incoming posts in folders, and a good aggregator will also help you keep track of read/unread posts, along with options to search, filter, and label post content. Many people use Feedly, but I far prefer Inoreader. If you don't use a blog aggregator now, try Feedly first (it's very user-friendly), and then you might migrate to Inoreader later when you are ready to take advantage of the wider range of features that Inoreader offers. When your students start blogging, you will definitely want to have some kind of feed reader in place in order to keep an eye on their posts as they accumulate (see below). Build the blogging into your course design. 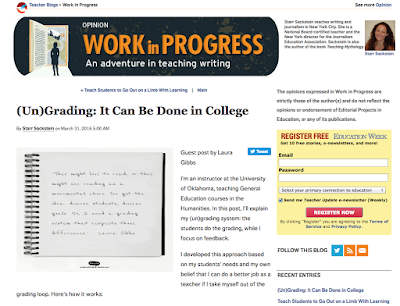 In my classes, all the student work happens in the blogs; there are no quizzes or tests, and there are no papers. Your classes might also use blogs intensively, or you might just use the blogs for a once-a-week reflection activity; it's all about what will work best for you. To see the kinds of work my students do in their blogs, take a look at this week's assignments: Week 9 (and that's a typical week; my courses use a week-by-week module design). Just how blogs will fit into your course design depends totally on the course. As a general design principle, though, I would advocate for consistent assignment(s) so that your students will get regular practice and reinforcement; that's especially important if your students are new to blogging. After a few weeks of doing the same type(s) of assignments each week, the blogging will become easy and familiar! 1. Start students blogging right away. After a brief overview of the class, the very first thing that my students do is to start their blog. Here's how that assignment works: Create a Blog. I follow that up with a fun ice-breaker type of assignment: Picture a Favorite Place. My goal is for students to feel confident and excited about what they can do with their blog right from the very start. 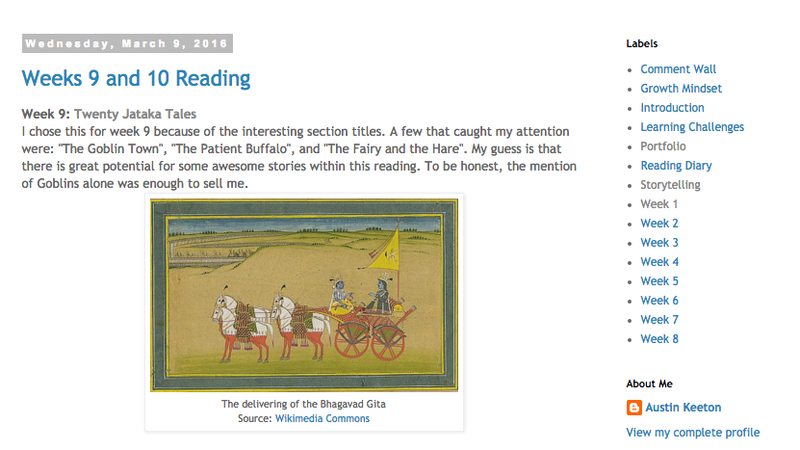 It's also a great way for me to start to get to know the students; I subscribe to their blog posts and comment feeds in Inoreader (see below) as soon as they create their blog, and that allows me to keep an eye on their work from the very first day of class. I also make sure to cover important technical issues right from the start: labels on blog posts, comment configuration options, name display / profile settings, creating links, inserting images, etc. That way, later assignments don't have to cover technical issues and, even more importantly, students can feel confident and in control of their blog right from the start. 2. Encourage students to customize their blogs. This is easy to do since the students are highly motivated to customize and personalize their blogs; some of them start customizing their blogs immediately, which is wonderful to see! To give them the support they need, I use "Tech Tips" for extra credit; the Tech Tips are not just limited to blog development, but the blog tips are definitely the most popular. Here is my Tech Tips list for this semester: Tech Tips: Blogger. The classes I teach are not technology classes, and some students are not interested in developing their technical skills at all... and that's okay. The extra credit Tech Tips are there as an option for any student who's interested. What's nice is that as the semester progresses and students watch each other's blogs take shape, even those students who were not originally interested in tech exploration often become curious about how to customize their blogs too. Also, while I've never had a student actually lose their blog, I encourage students to learn how to back-up their blogs along with any other work they are doing for class: Back-up, Check-up and Review. 4. Encourage use of multimedia in posts. Right from the start, I emphasize the use of images in posts, along with giving students a crash course in image licensing and helping them to find public domain and CC-licensed images to use in their blogs: Finding Images. I also make the use of images (and image citation) part of their blog post assignments. Then, as the semester goes on, I also encourage the use of video and other embedded media in blog posts; here's an example of a video-based assignment that I use in the review week mid-semester: Music for Your Comment Wall. Being able to work with images and video in their posts is something that can be highly motivating for students, especially for students who are less confident in their writing. 5. Build blog commenting into the class. Students are posting in their blogs every week, and they are also commenting on each other's blogs. I don't use discussion boards at all; instead, I use the blogs as the locus of conversation. To help the students get to know each other week by week, I use randomized blog groups, and that randomization also helps ensure that each student gets more or less the same number of comments each week. How it works: each week, I sort the class into groups of three students at random (I just use a spreadsheet with a randomizing column to do that), so each student is thus commenting on the blog of two other students each week while receiving comments back from those same students, and I also offer an extra credit blog commenting assignment for students who want to do more commenting. I also make sure to show students how to check their comments, using email notifications and/or the blog dashboard. 6. Revisit Introduction posts. 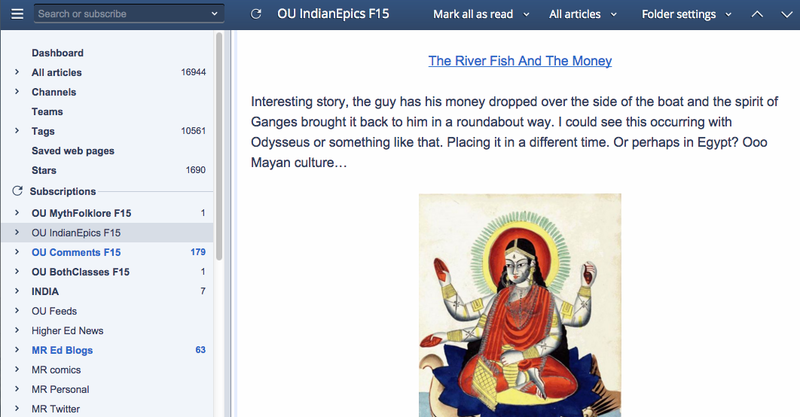 Each student writes an Introduction post in their blog during the first week of class. Then, as they comment on other students' blogs each week, they comment on the post(s) for that week AND they comment on the Introduction post so they can learn something more about that student, learning about each other. As a result, the Introduction posts get the most comments of any other post at the blog, and I encourage students to tinker with their Introduction post all semester long, adding pictures, videos, etc. Since my classes have appx. 40-50 students, the Introductions are important because students are meeting new people in class every week all semester long. Because they are Gen. Ed. classes with students from all the different colleges and majors, the Introduction posts are a lot of fun: the students are doing so many different things with their college careers! 7. Use Comment Wall posts. In addition to creating an Introduction post, I ask each student to create a "Comment Wall" post. The Comment Wall post provides a space where someone can leave a comment that is not in response to a specific post at the blog but instead as a conversational comment left for the blog owner. In my classes, the Comment Wall space is useful for all kinds of reasons: they provide a place for following-up with someone who may have left a comment at your blog, for complimenting someone on their blog design or asking them a question about their blog, and also for leaving comments about class work that is not blog-related, such as comments on project websites. Of course, just how that might work for your class depends on your course design and activities. Like the Introduction post, the Comment Wall space is where students are "presenting" themselves to other students in the class, so I encourage them to add a picture to the post, and later on to add video of some kind, just for fun. 8. Use randomization to increase discovery. Especially when a class is on the large size (as mine are), randomization is an important way to help all the students get to know as many other students as possible without a lot of work on my part. 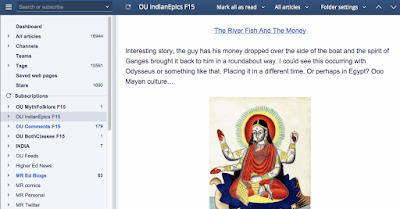 I use random blog groups each week for commenting, and I also build a blog randomizer so that students can visit the blogs in class at random: Myth-Folklore and Indian Epics. If students are looking for a specific other person in class, they can use the Blog Directory, but if they are just browsing, they can use the randomizer instead. (I build that randomizer with a wonderful free tool built by one of my students which you can find at RotateContent.com.) I also use the blog randomizer when I have some free time, especially at the beginning of the semester, so that I can spread my attention throughout the blogs randomly! 9. Reuse blog content. A great way to let students see that you value what they are writing in their blogs is to reuse that content. So, for example, in one assignment I ask students to reflect on the commenting culture in class, and I then collate their comments into a webpage: Thoughts about Comments. To get even more use out of their remarks, I create a randomizer which I can then use as part of the commenting assignment itself, reminding them about the different ways that people value the commenting process; you can see the randomizer at work in the yellow box here: Week 7 Comments. Of course, just how you want to reuse the content in your students' blogs will be based on your course design overall; the key is to think about the possibilities for reuse that blogs can offer, very different from classroom discussion which is not so easy to harvest and reuse. In addition, I try to design assignments so that the students themselves are reusing and revising their previous blog posts, building on past work for new assignments and also learning from what they read and see at other students' blogs. Such a great list Laura!!! I wish I had something to add, but I think you covered everything. I am sure you have this in your course, but I always have a blog entry of my own that explains why I want them to blog, how I hope they will adopt some part of learning out lout and that their voices are as important in the course as mine.